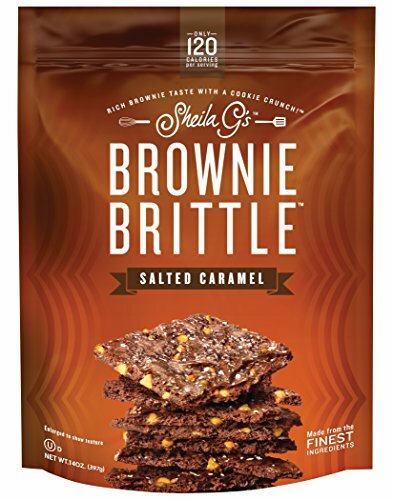 Like the crispy edge of a gourmet brownie, Sheila G’s multiple award-winning Brownie Brittle satisfies your chocolate desires with fewer calories than other sweet snacks. So crave away with these rich pieces of chocolate decadence you can feel good about. No more fighting for the corner pieces! It all began when Sheila G Mains lost her corporate job in the early 1990s. She turned her passion for baking into an opportunity by taking a treasured family recipe for fudge brownies and baking her way into a thriving business. You may have tasted one of her rich, dense squares of heaven at some of our nation’s finest restaurants and theme parks. Like many brownie aficionados, Sheila G is particularly fond of the crispy edges. In fact, she took great joy in walking through her brownie bakery, gathering the brittle batter off the sides of the sheet pans as the brownies cooled in their racks. And that is where Sheila G found her inspiration for BROWNIE BRITTLE – a thin, award-winning treat with a rich brownie taste, an amazing cookie crunch, and only 120 calories-per-serving. Deliciously versatile, Sheila G’s Brownie Brittle is great right out of the bag, as well as crumbled over ice cream, yogurt and cereal. More delicious recipes are available on the Brownie Brittle website, including s’mores, ice cream sandwiches, cupcakes and cheesecakes. We’ve got the EDGE on brownies.At only 120 calories/ounce, it’s easy to see why Brownie Brittle was named, “the health-conscious chocoholic’s dream come true,” by WeightWatchers.com. 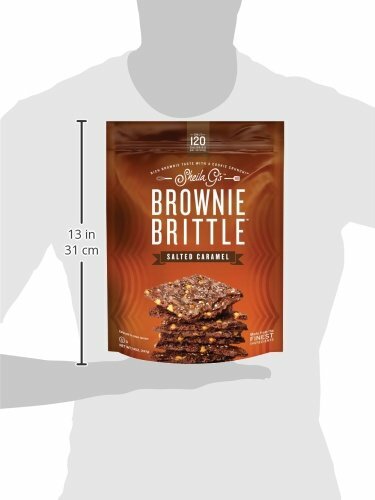 Brownie Brittle has got the EDGE on low calorie snacking. Certified Kosher OU Dairy, light, thin and crispy, and made with the finest ingredients. Brownie Brittle delivers rich brownie taste with a crisp cookie crunch so there’s no more fighting for the corner piece. This is guilt-free snacking foodies, health addicts and dessert lovers everywhere can agree on! Multiple award-winning product including Fitness Magazine Healthy Product Award, Shape Magazine Healthy Product Award, Oprah’s List of 7 Fabulous Finds, The Gourmet Retailer’s Editor’s Choice, Progressive Grocer’s Editor’s Choice, Most Innovative Product Award and many more. 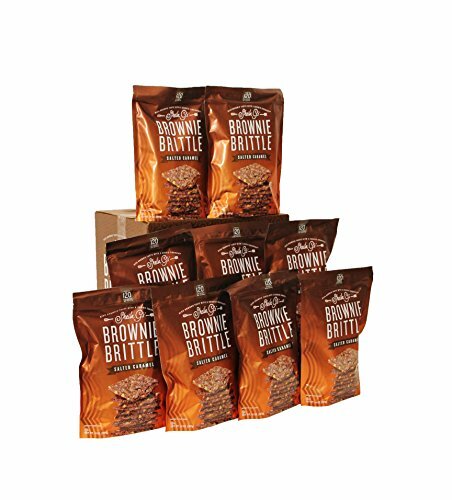 Brownie Brittle is available in numerous flavors and sizes, including Chocolate Chip, Toffee Crunch, Mint Chocolate Chip, Peanut Butter Chip, Dark Chocolate Sea Salt, Organic Chocolate Chip, Organic Pretzel & Dark Chocolate, Organic Chocolate & Toasted Coconut and seasonal holiday flavors. Brownie Brittle brings you one of our top selling flavors, Salted Caramel, in an entire case of our 14oz family-sized bags. 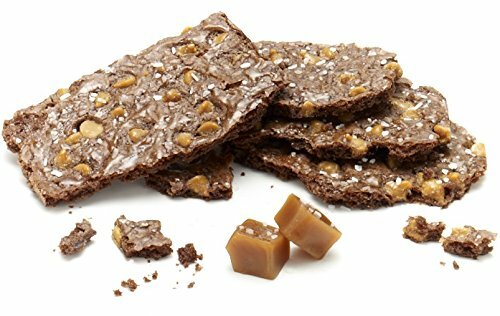 You’ll get 9 x 14oz bags of Salted Caramel Brownie Brittle to eat straight out of the bag, share with friends, give as a hostess gift, serve to company and to experiment with a variety of recipes. Use Brownie Brittle for your cheesecake or ice cream pie crusts, as a topping for yogurt or ice cream, put a twist on your s’mores or parfaits, and much more. Delicious and decadent!